Edited by Ryan Scott and David Sherbo-Huggins. 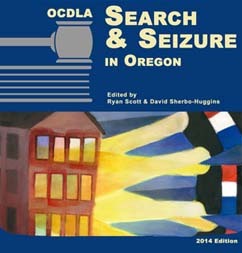 Search & Seizure in Oregon has been updated for 2017, with over 75 pages of case law updates & analysis. The updates from 2016 and 2015 are included as well. The twelve top ways in a which a search warrant affidavit is inadequate. An entire chapter just on beating inventories. The keys to winning a motion to controvert. Is it a search at all? Everything you need to know. Plus all the justifications for warrantless searches, and how to push back against them. In addition to the editors, chapters have been written by deputy defender Morgen Daniels with the Office of Public Defense Services, and former Chief Justice Paul J. De Muniz, now a distinguished jurist at Willamette University College of Law, and digital searches expert Bronson James. The goal (from the Introduction): "is to help you find the cases which will help you frame the issue, not to provide every case on a particular topic.The goal - the same goal since the first day of law school - is not to find out the right answer. It is to figure out the right question." 1. WAS THERE A SEARCH/SEIZURE? 6. IS DEFENDANT ENTITLED TO SUPPRESSION?